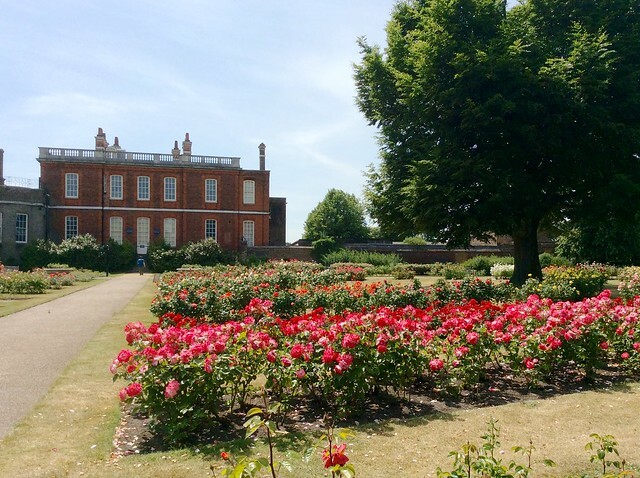 Welcome to my guide to where to see the best roses in bloom in London! After all, today’s the summer solstice, the longest day of the year, when the earth is at its maximum tilt towards the sun. What better way to spend it than looking at roses? Luckily the rose season is at it’s height right now. So let’s make a start. Queen Mary’s Gardens were always going to be a shoo-in for the top spot. Situated in the heart of London, in the inner circle of Regent’s Park, they’re home to the largest collection of roses in London, around twelve thousand roses. Enter through Chester Gate to see the eighty-five single variety beds, arranged in a circle around a central fountain and surrounded by a roped pergola draped with climbing roses. Walk on further and there are more rose beds all the way to the Jubilee Gate. Queen Mary’s Gardens, named after the wife of George V, were planted with roses in 1932. More about Queen Mary’s Rose Garden here. It was very hard deciding what to put in the number two slot with so many great rose gardens around. In the end I went for the Hyde Park Rose Garden. It’s not a formal rose garden like the others – it’s surprisingly soft and romantic with fountains, pergolas and winding paths. It’s the most scented of the five gardens on my list. Plus its very easy to get to – right next to the Hyde Park Corner entrance to the park. More about Hyde Park Rose Garden here. The fact that the magnificent rose garden behind the Palm House at Kew only makes it into third place shows how strong the competition is. It’s planted with a mixture of english roses, old roses and other shrub roses, as part of a three-year project, begun in 2009, to return the Palm House Parterres to William Nesfield’s original 1845 design. It boasts six thousand roses in 113 beds. Reach it via the District Line to Kew Gardens. The drawback is you have to pay to enter the gardens, currently £15 for a adult. More about Kew Gardens rose garden here. Another formal garden, arranged in concentric beds surrounding Ranger’s House, a red brick Georgian mansion situated in the upper part of Greenwich Park. The garden was redesigned in 1995 and contains 113 varieties of mainly hybrid tea and floribunda roses. It has a peaceful, country air with plenty of places to sit and contemplate. If you’re heading for the garden a good way to go is to get the train from Charing Cross to Blackheath and walk across the heath to the Blackheath Gate. It saves climbing the steep hill up to the observatory. More about Ranger’s House Rose Garden here. 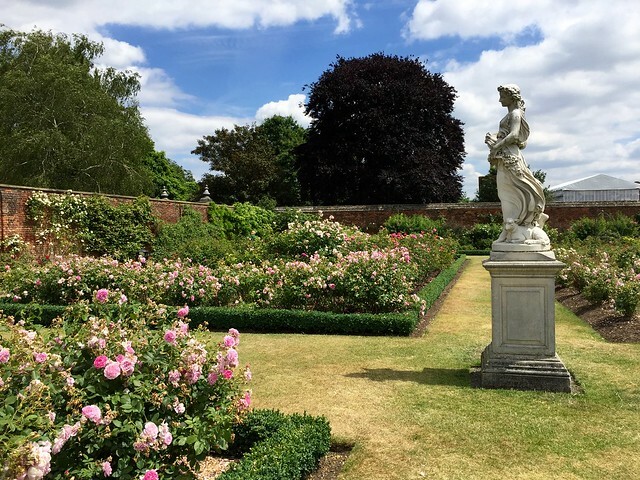 The Rose Garden at Hampton Court Palace is a lovely walled garden, with formal beds of roses set amongst green lawns and classical statuary in the centre. Rambling roses amble across the walls behind inviting benches. This pretty little rose is a Rosa De Rescht. Hampton Court Palace is a half hour train ride from Waterloo. Entrance to the Rose Garden is free, but it’s well worth paying the £5.80 charge to visit the formal gardens as well. More about Hampton Court Palace Gardens here. Holland Park in west London is best known for its Kyoto Garden and for opera in the park. You may not even realise it has a rose garden, because it’s quite small and hidden away. You get to it by walking past the little children’s playground by the café and the Belvedere restaurant. It’s next to the Orangery, now used for wedding receptions. It’s paved rather than being grassy like the big formal gardens, but it’s a lovely place to sit on a sunny day. This entry was posted in Flowers and plants, Holland Park, Kew Gardens, Regent's Park and tagged flowers, gardens, Greenwich Park, Hyde Park, London, nature, plants, Ranger's House, rose pergola, Roses by Fran. Bookmark the permalink. Totally agree with your choices! We spent today at Kew and much enjoyed the rose garden. We started, thanks to you, with the amazing exhibition in Shirley Sherwood Gallery and then spent the rest of the day, in a leisurely search for the heritage trees. It was a perfect day to spend at Kew – so glad you enjoyed it. A lovely guide 🙂 I am always on the hunt for signs of nature in London so thank you for sharing! You’re welcome – hope you enjoy visiting the rose gardens!